«What’s ready for harvest in mid-April? Nan would look out at the bright dandelions in the pasture near her home and remember fondly how her mother and grandmother would fill their aprons with the greens in spring. She spoke longingly of the how delicious they were, simmered in a big pot for hours,seasoned with salt pork. I knew Nan in her late eighties when she could no longer traverse the uneven ground outside to pick them herself,but the greens still called to her. Dandelions inspire in me,the same urge to consume. Any time I spot the distinctively jagged rosette of leaves,among the first to to emerge and growing so strongly,I want to dig and eat them. It’s as though the body craves the plant’s strength —the bitterness of the leaves,the slightly sweet complexity of the roots and all the beneficial minerals and vitamins that those deep flavors suggest. I prefer a light saute of dandelion leaves with browned onions,garlic and chili flakes to the old fashioned method of cooking the leaves to death,but there is a theory that thorough cooking is necessary to break down the cells in the leaves to make the minerals available. (Also a theory that the roots should not be over-cooked.) Whatever your approach,once you’ve developed a taste for dandelions, your spring won’t be complete without eating them. Europeans brought dandelions to the New World along with so many other medicinal and culinary herbs that have spread and become so common that our culture now considers them noxious weeds. But herbal traditions in both the East and the West regard dandelions highly,especially as a liver tonic. This concept of a tonic – a medicine that is useful,not for any specific disease or symptom but as a general enhancement to health —has been lost in the modern medical regime. Herbal texts often refer to dandelion’s ability to relieve “liver congestion,”especially after a long winter of eating heavy foods. I’m not sure what liver congestion means but it sure sounds like something I want to avoid! Among many other therapeutic uses,dandelion leaves are said to to reduce high blood pressure and the roots have been used to treat anemia, diabetes and to build strength after illness. Rosemary Gladstar noted that the medicines we need to treat our most common,everyday health concerns are found in the commonest plants growing all around us. So often the ones we work so hard to eradicate. Dandelions also have a tonic effect in the garden. The deep roots break up compacted soil and take up minerals that can be made available to garden plants. During the warmer months when dandelions are too bitter for eating,I’ll add them to my compost (removing the flowers first) or lay them on top of mulch. When weeding,if I come across a particularly handsome dandelion with large glossy leaves and a thick root,I’ll let it be so it can seed itself to improve the genetic strains of dandelion on my property. 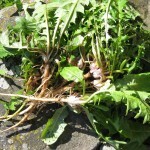 A big, juicy dandelion can be a far more valuable crop that those I planted deliberately in the garden. If you’ve haven’t developed a taste and craving for bitter flavors in spring,try dandelion greens cooked with starchy foods like risotto,pasta dishes or potatoes. They take the edge off the bitterness. A quick Google search will yield lots of yummy recipes. 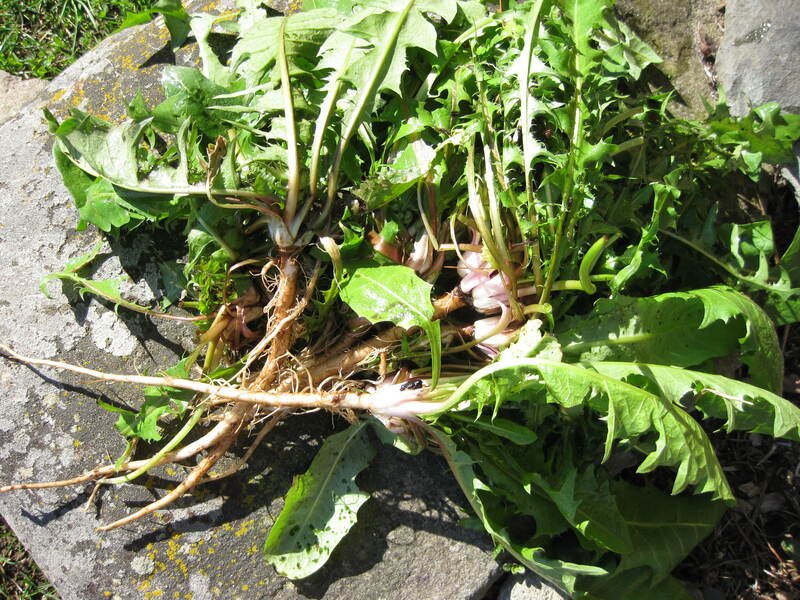 And for a dark herbal tea,ground and roasted dandelion roots can’t be beat (although some prefer the roots of another weedy relative,chicory). Always pick dandelions and other wild foods from clean soil,avoiding roadsides and edges of parking lots. Then savor the free food and medicine,compliments of Mother Nature.